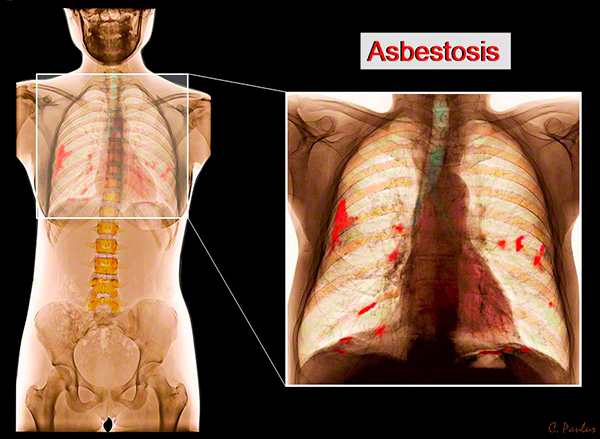 Asbestosis is a lung disease caused by exposure to asbestos. The main form of contamination comes from the inhaling of asbestos fibres, often 20 to 30 year prior to presentation of the disease. Asbestos is type of naturally occurring mineral that has six different sub types, each highly resistant to fire and other chemical processes that normally break minerals down. Asbestos fibres were widely used in construction materials, for buildings and automobiles, during the earlier half of the 1900s. Despite the link between it an many serious diseases, it is still used in certain areas across the world today, though with much more regulation than in previous times. In order to take a look at asbestosis in a little more depth, we’ve teamed up with Asbestos Advice Helpline, who’s website you can see here for more information on the condition. With asbestosis, the onset of the disease is gradual. Shortness of breath, difficulty keeping breath while being active, and wheezing accompanied by a phlegm producing cough are the general symptoms. As it progresses it can begin to lead to crackling sounds as the lung’s passages thicken and become congested. Diagnosing asbestosis includes pulmonary function tests and high resolution CT scans, or CXR scans. For some cases, the CT scan is preferred because it can present clearer and more precise imaging. Biopsies are not generally needed to confirm a diagnosis, due to the symptoms, function testing, and imaging, along with patient history being more than sufficient. For asbestosis itself, there is no treatment or cure. Once the damage is done, it is irreversible. However, managing the damage is the approach taken with asbestosis, as it can lead to chronic obstructive pulmonary disease (COPD) and cor pulmonale. Trying to keep the airways functioning and reducing the stress placed on the heart by a weakened pulmonary system are the main goals in treatment. Certain lifestyle changes are encouraged by the doctor’s, such as smoking cessation, including reducing exposure to other lung irritants. Patients dealing with asbestosis are also encouraged to get immunized against influenza and pneumococcal infections. Though the primary lifestyle change required of patients is to prevent further asbestos exposure. If they have an older home or frequent older buildings, it is advised to move and cease exposing themselves. In the UK and many parts of Europe, asbestos related ailments are beginning to present in increasing numbers. For patients dealing with asbestosis, the outlook can vary greatly. The severity of the disease depends on how much exposure to asbestos occurred, as well as if they smoke, or have other unhealthy habits of living conditions that can aggravate lung conditions. Some patients only end up having minor issues with coughing and shortness of breathe, while others can die from complications caused by other related issues.